PRN Rents and Ardus Medical's rental customers are in the hospital and alternate site marketplaces, including homecare, oncology, fire and rescue, and ambulance transport, with the highest quality pre-owned equipment available. Ardus Credit Corp. offers a trio of flexible rental programs that allow you to acquire needed equipment for a fixed-term of as little as 12 months. Whenever you need infusion pumps, ambulatory pumps, defibrillators, anesthesia machines, surgery centers, veterinary products, ventilators, sequential compression devices, enteral pumps, CPM's or monitors, we are just a phone call away. All equipment that is shipped from us will arrive in patient-ready status with operations manual available on-line. For additional information regarding rental rates and availability, please complete our More Information Form or call 1-855-59-Ardus. With the Rent-to-Own Program, you can enter into a fixed-term contract ranging from 12 to 60 months. If you prefer to purchase the equipment after a required minimum period, a percentage of each payment made is credited toward the original purchase price. The Ardus Credit Corporation Capital Lease offers simple and straightforward finance terms. Your equipment can typically be treated as an asset on your financial statements. Homecare Company wishes to acquire $15,000.00 of new equipment. They know the equipment has a long life span and would like to own the equipment at the end of their contract term. Their capital budget only allows for approximately $400.00 a month in equipment expenditures. In this case, Ardus Credit Corporation would structure a 60-month capital lease. We would require no down payment, so the company could use their new equipment for a full month before they had to start making payments. The Ardus Credit Corporation Operating Lease helps you acquire the equipment you need and allows you to pay for it out of your operating budget. Homecare Company wishes to acquire $20,000.00 worth of new infusion devices. This equipment traditionally sees heavy usage and historically needs to be replaced every 3 years. 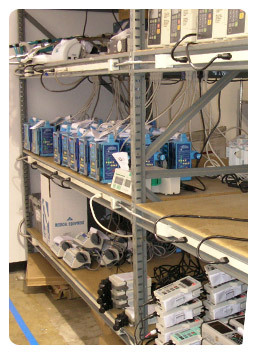 The company would like the option to return the equipment after three years in the event they need to replace or upgrade the pumps. In this case, we would structure a 36-month operating lease. Our terms would feature no money down, so the company could use the new pumps for a full month before they had to start making payments. To find out how much you can save on medical equipment rentals, medical equipment leasing or medical equipment financing call today!